Deciding that they didnt want to be too close to Richard Hahn (Marianne's brother), the family moved to Oakland, California. Alex and Vera had made good money overseas and converted it into dollars. Still, they both had jobs within two days of arriving. Alex worked in retail and Vera worked as a bookkeeper/cashier for five years in a clothing store. 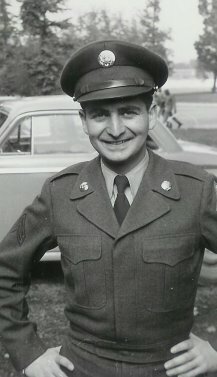 In 1951, Alex was drafted by the U.S. Army (as a registered legal alien, one could be drafted) and was sent back over to Europe. He was stationed in Germany of all places, where he worked in the intelligence unit (although his letters mention his work in the PX). In his Army exams, he scored higher on tests than anyone had scored before, so they asked him to go into officers training, but he declined because he didnt want to stay in the Army for an additional year. Over in Europe, he met a German girl and lo and behold decided he wanted to extend his stay past 1953; however, Vera had his money which she refused to send over because she wanted him to come home. He returned to Oakland and, seeing anew the American women, quickly reconsidered his decision. Vera met Gene Siporen through friends in Oakland in 1953, while Alex was in Germany. Alex wasnt thrilled with Gene. After his return, Alex applied for the GI Bill right away to continue his studies (1954). Although he only had a ninth grade formal education, he easily passed the equivalency exam. He enrolled at UC Berkeley and completed his undergraduate degree in three years (finishing 6th out of the graduating class). He was elected Phi Beta Kappa as a junior and was honored as the outstanding Cal student of year. He received nearly all A's and a total of three Bs in college--in German, Golf and Swimming. Alex then studied for his CPA. He worked as an accountant at Haskins and Sells for two years after passing the exam. Haskins & Sells had a training class for newly hired CPAs where the first person to learn all of their classmates names was presented with a monogrammed briefcase--Alex earned the briefcase. During this time, he was teaching Cal-Extension courses and realized that he loved teaching, so he bypassed an MBA and went directly into a PhD program. He received his doctorate when his son Mark was two (1961).